FDL Pro-Series Front Hub Kits offer complete disc brake upgrade solutions for OEM drum brake spindle applications for the popular 55-57 Chevrolet 210 / 150 /Bel Air Passenger cars. Based on the venerable forged billet Dynalite caliper and 11.00� x .81 rotors, these versatile kits are easily optioned to suit the braking requirements and style preferences for a daily driver, serious competition, or the most discriminating show enthusiast. This kit requires no modifications for installation, and provides plenty of clearance inside most popular 15� wheels. 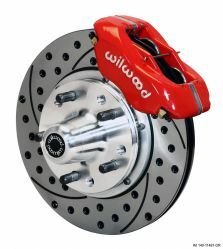 This kit will also work with aftermarket 14� disc brake steel wheels available from other vendors. FDL Pro-Series kits can be used with either manual or power boost master cylinders.